RyansRally.org: Recognized Among Top 5% – We Got This! It’s been some time since I provided an update on how the website is performing. Actually, I believe that was when it exceeded a million views a few months ago. The crazy thing is, this only includes the time since I began tracking this in December 2010. In effect, I didn’t capture an entire 13 months of data, making this significantly understated. By my estimates, viewership easily exceeds two-million (probably closer to three million). So, what I did was pull some facts that I thought you might find interesting. Read through it, but please pay special attention to the last part. It’s a big deal! Note: Delaware, the home state of the attackers, ranked 6th. Note: The other defendants named in the civil suit all ranked in the top 10. Total Websites Worldwide: 644,275,754 (As of March 2012). 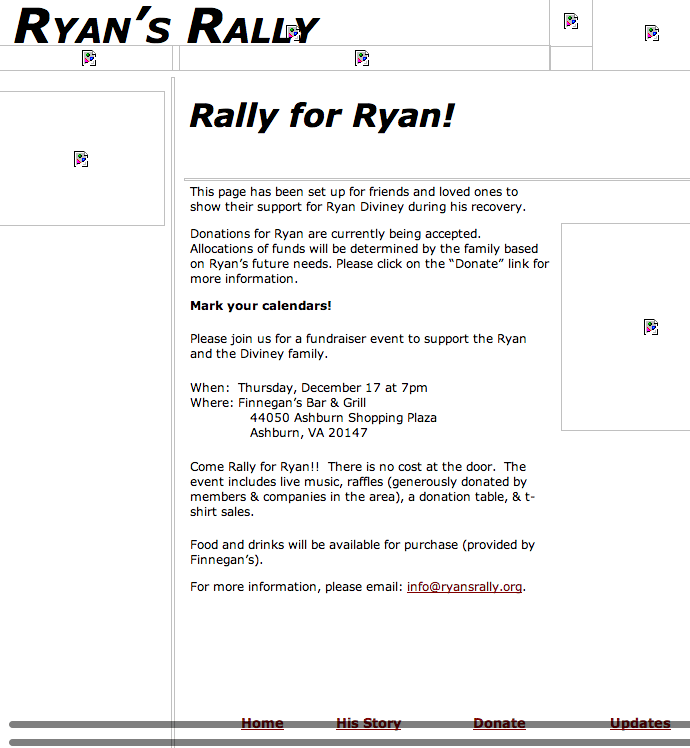 RyansRally.org Rank: Recognized as a “Top 5%” of active websites worldwide, at 4.8%! The Website Rank is how popular the site is compared to every other. This includes page views, total reach, referrals, back links,and more. Also, sharing posts on your personal FaceBook seems to be a big deal. Please, share often! It’s important. Can you believe it? Because of you, RyansRally.org is this popular! Your interest and others who continue to make it grow motivate me to make it better at every opportunity. For fun — and a walk down memory lane — below is a screenshot of our website at its infancy (minus the images). You can scroll your cursor over it to enlarge it. As basic as it began, it served the purpose well. This was a year before I delved into it and began adding my touches. My inexperience caused some growing pains, especially when the readership traffic was more than the server could handle! I remember scrambling to get it back online with a hosting company that could handle it. It was too big for its britches! Ken, you so far exceed our expectations of a parent, caretaker of Ryan, blogger — what can I say except repeat for the umpty umpth time, “You are the best man for the job!” I can’t say it enough. I think about how fortunate we are to have you with Ryan, and I am so thankful for this. No one could do it better! I pray for you, Sue, Ryan and Kari more times during the day than I can count. Obsessed? Yes, as many of us are, but it is a good obsession — and necessary for Ryan’s well-being. Ken — WOW!!!!! A big part of this website’s success is due to you being able and willing to make it work!! Not everyone is as adept at learning these programming languages, finding the appropriate platforms, etc. But I think perhaps the biggest driving forces are (1) that so many people love and admire Ryan and your family and (2) let’s face it, you are an excellent writer!!! Most people are very busy and have a lot on their minds — so the fact that they’re willing to take a moment to read your blog everyday says a lot about its quality. I also have to believe there are many who come here for information, education, inspiration, motivation and encouragement. It’s a crazy world out there, and it helps to know you’re not alone –that there is someone else who is battling fatigue, fear, sadness, frustration, anger and everything that comes with dealing with such an emotionally taxing and physically demanding situation. Most of all, though — it’s an extraordinary thing to watch your family maneuver every obstacle to make sure Ryan gets what he needs. Ryan receives what I call the “gold standard of care,” and it is something to behold. Also knowing that others are stepping up to help you care for Ryan refreshes my spirit and renews my faith — it gives me joy and helps me see light in an often dark world. Yes, your website is many things to many people, but the one thing we have in common is that we love and admire your family, and we believe in Ryan. To be able to bring together so many people from so many backgrounds is quite an accomplishment. In fact, it’s down right amazing!! Hats off to you, a bow, and a toast with the good stuff in a crystal cup — that noise you hear is cheers coming from Team Diviney here and all around the world. Thank you for letting us be a part of your lives. As the song says … Long may you run! Will always be here reading, and thank you Ken and Sue and Kari too to let us all be part of yours and Ryan’s life. Site is an excellent web site. Primary interest is to check on updates about Ryan; secondary is the additional information and infomative postings from those comment each day. The site has continually improved and is very efficient and informative. It’s a good experience for the viewer. Thank you for maintaining it for us. Many eyes and hearts keeping Ryan relevant! Makes me happy that there are so many caring people out there. I first learned about Ryan when my son brought home a notice about his elementary school collecting donations. Immediately I visited your website and cried as I read, heartbroken for Ryan and inspired by your family commitment. You and your family are extraordinary! Simply amazing! !